The heavy metal group known as Attempted Revenge have released their latest EP record, “Origins.” The album contains seven original tracks for a listening time of nearly half an hour, making it a comprehensive introduction to this skilled group of rock titans from Brooklyn, NYC. It has been proudly published as an independent release without the direction of the corporate music industry. High-octane, full-throttle, and boasting atmospheric, narrative songwriting, “Origins” will put Attempted Revenge on the map of American metal for fans around the globe. Attempted Revenge cite as main artistic influences Disturbed, Avenged Sevenfold, Slipknot, and Dragonforce. Their own style is as complex and technically advanced as these, and with similar tones overall. However, Attempted Revenge captain their songs with less ostentatious vocals which neither scream nor growl, setting them apart from the nu-metal norm. Listeners who have grown tired of such conventions are likely to appreciate Attempted Revenge’s story-driven songwriting. Listeners curious to know the backstory of said “S.L.O.P.P.Y.” will need to check out the record’s second track of the same name. It’s safe to presume “Origins” is a record with a mythos of its own, one which Attempted Revenge fans are likely to have made themselves acquainted previous to the release of the album. “I’d love to thank everyone that has been with us since the beginning!” says drummer D’Weasel. 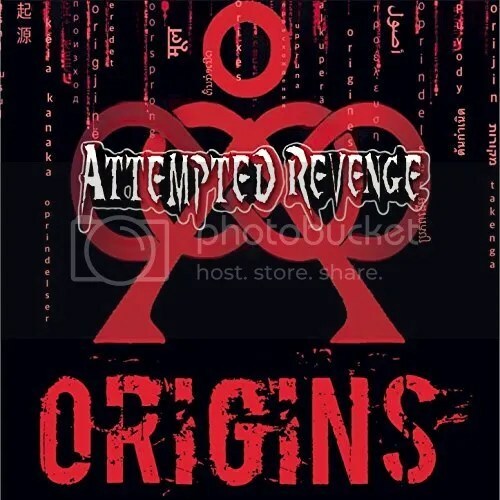 “Origins” by Attempted Revenge is available from over 700 quality digital music stores online worldwide now.